[Episcopal News Service – Red Shirt Table, South Dakota] The congregation here, Christ Episcopal, is known as a family church, where the longtime pastor and family patriarch, the Rev. 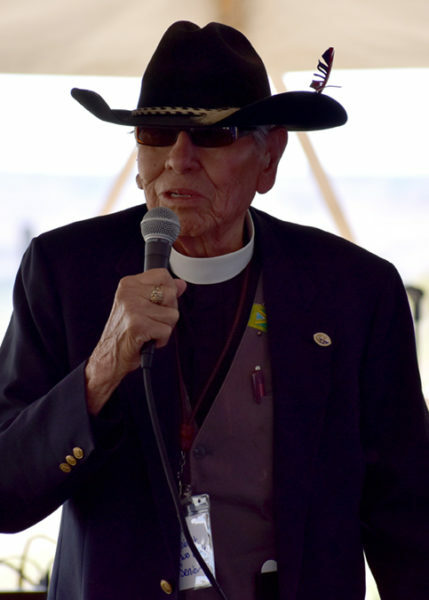 Robert Two Bulls Sr., has led services for decades in a small building overlooking the western edge of South Dakota’s Badlands on Pine Ridge Reservation. His ancestors arrived in the Red Shirt area in the late 1800s, “like a ship going through uncharted waters, but they fell in love with this place,” Two Bulls said. They built the first log church here in 1909. It is a tiny congregation in one of the poorest counties in the United States, but Two Bulls has long dreamed of hosting the Niobrara Convocation, an annual gathering of Sioux Episcopalians. 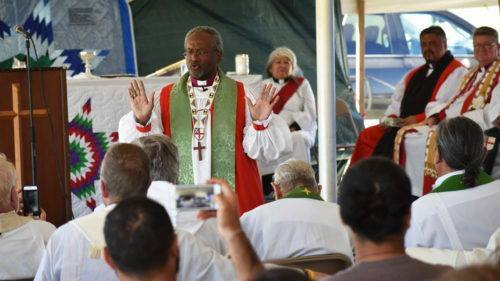 So last week, in an encampment full of welcoming smiles, few smiles were broader than that of Two Bulls as the 145th Niobrara Convocation convened in a big-top tent next to his church. Several hundred attended June 22-25, as they have nearly every year since 1870. Two Bulls’ daughter, the Rev. Twilla Two Bulls, was ordained a deacon in the Saturday afternoon service, and Presiding Bishop Michael Curry delivered a rousing sermon June 25 at the convocation’s concluding Sunday service. Themes of family and oneness seemed to be on the tip of every tongue. “We all come from one God who made us all, and if we only got one God, I’m your brother,” Curry said toward the end of his half-hour sermon. Family and relationship-building has been the driving force behind the Red Shirt Project, which served as a common thread running through much of this year’s convocation. The project’s youth missionary team helped with everything from raising the tents to preparing Saturday’s much-anticipated bison dinner. The Red Shirt Project began in 2000 as a fledgling partnership between Two Bulls’ son, the Rev. Robert Two Bulls Jr., and the Rev. Michael Cunningham. It now organizes an annual summer road trip, bringing young people from the Los Angeles area to South Dakota to work with the local Oglala Lakota community on service projects. “We’ve got to live the Gospel. We’ve got to work the Gospel,” said Cunningham, rector of St. Mary’s Episcopal Church in Lompoc, California. Participants on past trips to Red Shirt have helped build a baseball field, an arbor and a straw-bale structure that someday will be used as a coffee shop and store. 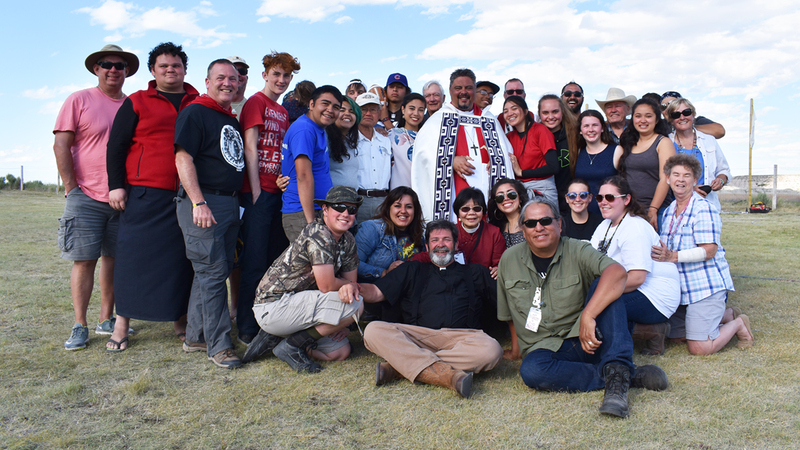 This year, the project’s group of 37 missionaries included a six-person Maori delegation from New Zealand, led by Bishop Don Tamihere. “Indigenous people tend to share a common soul,” Tamihere said. He and his diocese have been involved with Red Shirt Project for about 10 years, and they were eager to show their support for the Niobrara Convocation. The historic oppression and marginalization that the Maori have experienced in New Zealand mirror American Indians’ plight, he said. The Episcopal Church’s involvement with the Sioux began in the mid- to late-1800s, when the federal government offered land to various Christian denominations in exchange for their complicity in its effort to force Indians to assimilate into the white settlers’ culture through the reservations system. 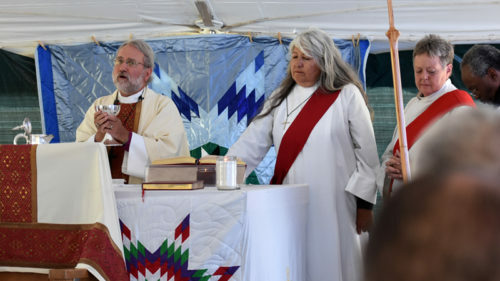 Today, Niobrara Convocation still functions like a family reunion, with tribal elders and church leaders reporting on what has happened in the past year in their congregations across the Niobrara Missionary District, created in 1871 and including parts or all of what are now North Dakota, South Dakota, Wyoming and Nebraska. Some of the reports are bleak: Poverty is a persistent challenge in many Native American communities, as it is here. The pool of clergy members is spread thin. Those who are active spend much of their time presiding over funerals. Drug use is on the rise, and suicide is a constant scourge. And yet, these gatherings also are filled with great joy and solidarity. Among the elders and church leaders presenting reports in a session known as “ingathering” was Gladys Hawk of St. Elizabeth’s Episcopal Church in Wakpala, South Dakota. Her son assisted her to the microphone so she could present donations that the congregation raised for the Niobrara Council. “Even though there are not too many of us [elders] left up there, we stay busy,” Hawk said. She is 79, and afterward, she said she never misses a Niobrara. This year, she brought a quilt to auction, to raise money for a new multipurpose building at St. Elizabeth’s. The addition would provide the church with access to modern restrooms for the first time, among other improvements. 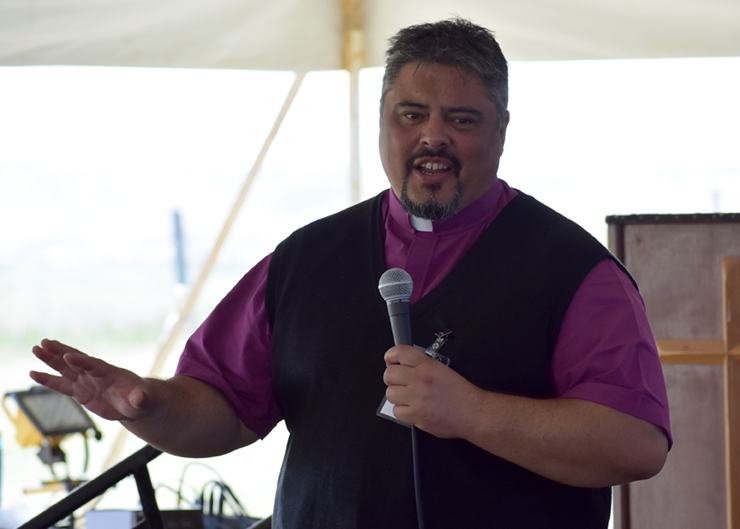 South Dakota Bishop John Tarrant described Niobrara Convocation as unlike any other gathering on the Episcopal Church’s calendar, starting with its minimal cost to attend – little more than the gas money to get there, if you’re willing to pitch a tent on the grounds. And the ordination June 24 was a jubilant moment. About 200 turned out for the service, nearly the same number as would attend the worship service the next day and hear Curry’s sermon. The new deacon, Twilla Two Bulls, 58, was a figure of constant movement over the weekend, accepting congratulations while making the rounds to ensure meal preparation was progressing on schedule. She has helped with worship services at Christ Episcopal for 50 years, since she learned to play the church organ as a child. Now as a deacon she will be able to play a greater role in keeping this family church running. At her ordination, she was surrounded by family, including Cunningham, who has been adopted into the Two Bulls family as a brother. He delivered the service’s sermon, offering Twilla Two Bulls advice and encouragement. This year’s Niobrara was bittersweet for Cunningham. The Friday morning Eucharistic service, with Two Bulls Sr. as celebrant, was dedicated to the memory of Cunningham’s wife, the Rev. Deborah Dunn, who died suddenly in April from complications of a stroke. She was 65. Dunn, ordained in 1991, was rector of St. Peter’s Episcopal Church in Santa Maria, California. She and Cunningham had just celebrated their 40th anniversary. “She was a remarkable priest, a remarkably gifted priest,” Cunningham said. Tamihere said he sees parallels, as a Christian, to Jesus’ command to “love your neighbor.” But the Maori also can hear in the New Testament echoes of their own native beliefs. “Our first response to the Gospel was to say, ‘That’s very familiar,’ ” he said. Curry, in his Sunday sermon, initially was fired up by the Old Testament reading. He used the story of Hagar and her son, Ishmael, in Genesis 21 to make a point about the generational struggle against oppression. God told Hagar to fear not, because Ishmael would grow up to become a great nation. He repeated the sentence several times in the sermon. He later developed his point in the context of “the dynamics of oppression.” Teach a people to hate themselves and their traditions, and it becomes easy to control them, Curry said, equating the experience of African-Americans to that of Native Americans. The worshipers were receptive to Curry’s message, but the day before, he was on the receiving end of a spiritual challenge. During the service of ordination, Bishop Tamihere presented several Maori cultural items as gifts to the Episcopal leaders gathered there. He concluded by saying he offered the gifts with a cost attached. His people suffered for centuries under colonial rule and an Anglican structure that, for much of the church’s time in New Zealand, deprived the Maori of a full voice in their church. “But we continued to believe in the Gospel and continued to believe in God’s call,” Tamihere said, and now the Maori have won greater autonomy. His position as bishop is evidence of that progress. “That you would consider the plight of your native people, that you would do all that you can to alleviate the injustices that are still visited upon them … that you will expend all the energy that you have within your heart, body and soul to raise more native lay leaders, more native deacons, more native priests and more native bishops, so that there will be no injustice to be found in any corner of any diocese that you are responsible for. Thank you for the wonderful coverage! My wife and I had the rich opportunity of meeting Sister Margaret Hawk at the 1970 Episcopal General Convention in Houston. She was a member of the Episcopal Church Army and ministered in her native Pine Ridge Reservation. Photos she shared of the poverty were remarkable. One especially of a mother and children living in the rusted hulk of an abandoned automobile was tragic. Thank you for this article. I attended the Sunday Eucharist but not the risk of the Niobrara Convocation. When we arrived at the tent for worship, beautiful Native American star quilts were being auctioned by Episcopalian priests (primarily white) to the highest bidder. We were surrounded by the stark beauty of the Badlands. This place was only miles from Cuny Table where Native Americans danced the ghost dance in preparation for the return of the Messiah. The ultimate result was the massacre at Wounded Knee. No recognition of this was mentioned. This, indeed, was sacred ground. It seemed stereotypical to me. White Christians auctioning Native American art….in preparation of Eucharist. And while Bishop Curry yelled “save the children”, very few were in attendance. He also stated that it is important to “love yourself.” I am honoring that mandate by stating my views. Social justice can not be obtained without reflection of personal beliefs. I honor the Native American elders who were present. And the Episcopal Church in Pine Ridge which served as a make shift hospital in December of 1890. It is boarded up now. My heart is filled with hope this morning. Thank you for this Spirit-filled report of Christ’s love at work in a very heard place. My heart is also lifted in reading this. My father, Bishop James Warner of Nebraska 1976-1989, spoke of attending Niobrara with joy and love. This article gave me some great insight into the history.